Sometimes you see people on the internet and wonder if they really eat the way they portray themselves online. Apparently, if you’re Jimmy’s Burgers, you do. The owner of Easey’s Burgers in Melbourne and a total burger fanatic (he’s eaten over 3,000 burgers in his time), Jimmy has literally written the book on burgers. No, really… Check out The Burger Book—Victoria. We followed Jimmy’s Burgers and his stomach around for a week to see just what a man like him consumes. Spoiler alert: it’s a lot. Sure we’re a little concerned for his health, but mainly we are impressed. How does one man eat so much and still fit through doorways? Read on, and you’ll see what we’re talking about. Lets kick this thing off on Thursday night! I had booked for dinner at Saint Crispin and rolled up to tuck into their 5 course Chef’s Tasting Menu. I only ever hear amazing things about this place and was super excited to get stuck into a feed. I sat down ready for this fine dining experience and was pleasantly surprised because I knew two of the floor staff. What made it even better was that they had Melbourne Bitter long necks. If you know me, you know I love MB. It was the perfect accompaniment to my dining experience. First course was a cheeky little salad. I am not normally a fan of a salad (I have enough friends). This one was particularly thoughtful and tasty. This salad was a good one; made with small pieces of asparagus, kipfler potatos, crushed peanuts and a parmesan custard topped with crispy thin sliced radish. Second course was the most thinly sliced and lightly seared kangaroo loin served with amaranth, rosella flower, sour cherry and smoked carrot. Third up was crispy pork jowl and braised pork shoulder served with tarmosalata, watercress and pickled vegetables. The fourth course was Bannockburn chicken breast, a shitake and chicken wonton, stuffed chicken thigh, Szechuan eggplant and a chinkiang glaze. Finally was a delicious dessert was mango inspired dessert with a mango parfait and lime jellies. I then went home and devoured half a packet of Tim Tams, some Mint Slice and a bag of Allen’s party mix. I woke up Friday and headed in to work at Easey's. We were planning a new special to represent Berlin and we decided we would go with a kebab burger. Anyway, I was so hungry I had to make myself a BLT bagel so I loaded up stacks of bacon, lettuce, tomato, cheese and mayonnaise for a feast. A few hours late I hopped on a flight to Adelaide and downed some choc chip cookies and a glass of Chivas. After my meeting, the accountant busted out Nikka Japanese single malt and I punished a couple of those served up neat. I managed to squeeze a feed in at one of my favourite places in Adelaide, Bread & Bone. They do an amazing burger, this time I opted for a double cheeseburger with bacon. It never fails. 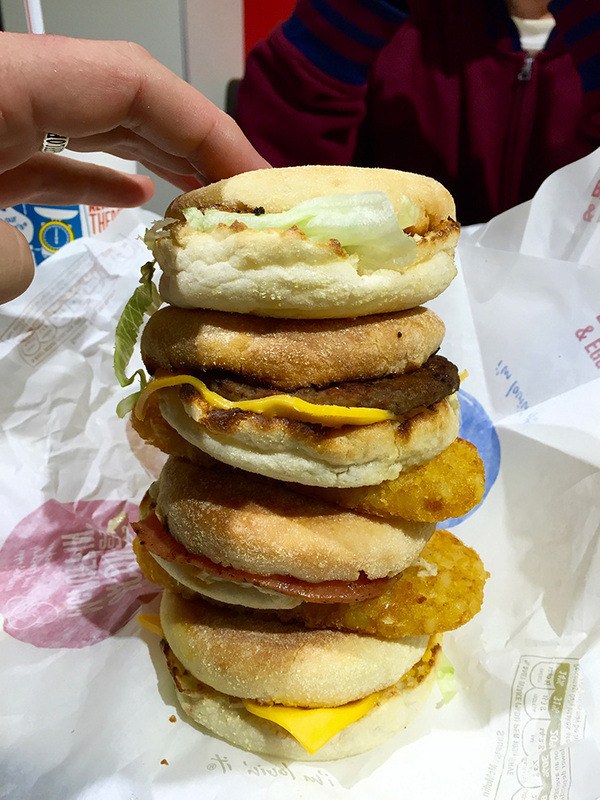 I had a few whiskeys and, before I knew it, it was already breakfast time at McDonalds. I wandered over the road from the hotel on Hindley St and grabbed a feast. I copped two Sausage McMuffin meals and two BLT muffins. I decided I was going to stack them all together and eat it like a beast. That was enough to put me to sleep. I woke up feeling very dusty but managed to make my way to Burger Theory on Union and Ebenezer Street for a cheeseburger with bacon and some frozen custard. I then wandered around a number of Adelaide’s finest establishments and sampled their amber offerings. It was now time to fly home but before boarding my flight back home I decided I would tuck into a burger at the Coopers 1862 bar at Adelaide Airport. It was served on a sourdough bun with cheese, bacon, lettuce, tomato, a tomato relish that was very sweet, caramelised onions, and a side of thick cut chips. Then, on to the plane for the flight home, I grabbed a cheeky bag of roasted cashews and pretzels to accompany my whiskey. When I arrived back in Melbourne after a quick nap I grabbed myself a large pizza and a garlic bread from Pizza Max via EatNow. The next day I was back at Easey’s and punished a Changaz Sanga (fried chicken sandwich) and some chips followed by one of our Melbourne Bitter battered potato cakes (potato scallop). After a Sunday session at the pub I went in on a Kingz Kebab from Kebab Kingz on Spencer Street. Just a jumbo kebab with lamb, tabouleh and extra garlic sauce with half a packet of Tim Tams for dessert. On Monday I had to prepare a special for Easey’s so railed 7kgs of lamb leg and rubbed in my own kebab seasoning. The plan was to make a doner kebab burger for our Graffiti Capitals of the World event for Good Food Month. I cooked the lamb on my spit for six hours and snacked on it all day. Then, for afternoon tea, I made the Kreuzburger. A cheeseburger with lettuce, tomato, onion, kebab meat and garlic sauce. Then I made a double of the same thing for dinner and polished off a serve of mac n cheese for dessert. I got up and went to one of my favourite local cafes—Code Black—because they make the best ham and cheese croissants I have ever eaten and they do an incredible cold brew coffee. For lunch I had a cheeky rowdy double cheeseburger from Easey’s—double patty, double cheese, double bacon and jalapenos and a side of fried chicken tenders. Tuesday night I had a meeting with the powers that be from Molson Coors and we visited the newly opened American barbecue restaurant at Crown called San Antone by Bludso’s BBQ for a full on family feast! We ordered a lot of everything. I was in my element—meat and food everywhere. Eating barbecue is best served family style, that means just dump trays of everything and everyone takes what they want to their own plate. I ate three brisket tacos, one pollo en mole rojo taco (chicken), mac n cheese, brisket, pulled pork, two beef links (sausages), barbecue chicken, coleslaw and some corn chips and guacamole. We followed it up with some dessert from Easey’s, some Nippy’s Strawberry custard filled doughnuts and some deep fried chocolate pop tarts. For breakfast on Wednesday I went to visit a little café around the corner from my house called Frances. It is run by some childhood friends of mine Soph and Stef. They do amazing breakfasts and I decided on some pancakes. These are American style brown sugar pancakes served with a caramelised banana and salted caramel and vanilla bean ice cream. For lunch I was at work again and ordered a Changaz Sanga (fried chicken sandwich) with some of that kebab meat I cooked on Monday and some garlic sauce in it. I took my Venue Manager Danny to see Def Leppard and after quite a number of frosted ales, I turned to my old faithful… the Kingz Kebab! All the meat and all the tabouleh! Waking up a little dusty, I grabbed some fried chicken tenders from Easey’s while I worked away. Pretty soon it was time to get to Mr Scruff’s on Smith Street to sample their new menu. WOW! I have never been more full in my life. Nachos for entrée, swiftly followed by edamame, smoked corn, mac n cheese croquettes, onion rings, corn puppies, fried chicken, beef ribs with BBQ sauce, poutine, chilli cheese chips and the whopping burger I designed. I took their usual cheeseburger and added in their Philly Cheesesteak and a butterflied reuben sausage and some bacon. After all the savoury, we still had to have some sweets which involved doughnut ice cream sandwich and Snickers waffles. I had to head back to work to do some painting and after I had finished I snuck in a cheeky burger bun filled with kebab meat, cheese and garlic sauce.